The Tom Northey series concludes today, wrapping up his 2000 treatise forecasting the future of our profession.1 He foresaw systematic changes headed straight at us and anticipated questions and issues that would rain down upon us. Northey predicted a world of Audiology survivors and losers, advised Audiologists to look beyond hearing aids for survival strategies, and gave Audiologists common-sense recommendations which we have yet to heed en masse. His changes, questions, and issues–parapharased or directly quoted below–did not miss the target. Most have come to pass or are in process. As in past posts, liberties are taken: “PSAPs” and “OTCs” are substituted for” disposable hearing aids,” since the former presently pose a bigger technological disruption than the latter; words and phrases are liberally italicized to draw readers’ attention to them; some anchor pricing is inserted to make the discussion relevant in today’s perceived market. If the introduction of the PSAPs is successful, many practices will have to adjust their staffing models in response to the dramatic decline in profit margins and revenue streams. Audiology practices (including ENT practices) will no longer be able to afford to pay salaries that are not tied to performance and/or productivity. Practice owners will be forced (due to shrinking profit margins) to consider hiring the most inexpensive professionals and possibly technicians at lesser hourly rates to carry the bulk of the work load (programming, fitting, paperwork, adjustments/follow-ups, etc.). The owner/professional/audiologist in the practice will possibly only perform the necessary duties required by state regulations (testing, prescribing, etc.). Gross charges in a practice (under a PSAP/OTC scenario) may stabilize after the initial disruption caused by an increase in patients willing to try these new hearing devices. However, profits will fall dramatically — even in successful hearing aid practices! Comment: Introduction of PSAPs and Internet hearing aid sales is deemed successful, based on Googling terms like “hearing aid,” “PSAP,” OTC,” counting the number of advertisements, and CEA’s stamp of approval. These devices and distributions channels are not going away. Audiologists’ efforts to adjust staffing models to accommodate the new realities are in their infancy at best, with only a few brave souls writing about how it might be done. Today, an average of 3-5 visits per patient are required to successfully fit a patient with hearing instruments. How will these hours of time spent per patient be recouped (with respect to cost) when the instrument sells for $399? Of course, unbundling may help but patients will be extremely hesitant to pay for services that were previously offered for ‘free’. Sheer volume is the only way a PSAP-like product can make any type of profit for the dispenser. Unfortunately, the volume of dispensed PSAPs required to pay the rent, salaries, insurance, utilities and taxes will likely preclude the audiologist from spending appropriate time counseling patients and discussing aural rehabilitation to assure a successful transition from hearing loss to hearing aid wearer. What are the chances your patients fit with PSAPs will not be coming back into your office with complaints? Not very good, I believe. How will you charge them for your time and energy and expertise when you trouble-shoot, solve and correct their problems? Comment: I don’t think anyone has come up with answers for these issues. Some practices are charging Internet purchasers for follow-up services, but no data are forthcoming yet on how many consumers are calling, how many are taking Audiologists up on the services, what prices are being charged, and how consumers are reacting to the pricing. Readers are encouraged to send such data to Hearing Economics. What’s to stop your competition from using PSAPs to generate traffic? Will hearing aid manufacturers be able to regulate sales techniques such as ‘giving away’ non-hearing aid products to attract new patients into the office? If not, expect OTCs to be utilized much like hearing aid batteries: ‘Free pack of batteries (or OTCs) included with your free hearing test/otoscopic exam through Dec 31st, 2014!‘ These strategies will ensure that PSAPs/OTCs will become a loss leader product in your practice. Currently, hearing aids are classified as Class II Medical Devices. 2 and therefore must be dispensed (fit) by a licensed professional. This (for now) should make Internet sales illegal. But then again, isn’t Crystal Ear still in business? Comment: The FDA and many commentators of different stripes are all over this issue, trying to delineate hearing aids (regulated) from PSAPs (unregulated). The strategy of PSAPs-as-loss-leaders has yet to catch on in bricks and mortar practices, though Chris Schweitzer’s suggestion to use PSAPs to “incubate” future patients seems an excellent idea. As for Crystal Ear, see Staab’s Hearing Aid Distribution series for an update on that company and all its many younger cousins. What if audiologists ‘push back’, refuse to sell PSAPs, or are resistant to selling the product for whatever reasons they might see as reasonable? The PSAP manufacturers/sellers/distributors (at the urging of various stakeholders) could ‘go around’ the established hearing aid dispensing model. How? They could easily place audiologists or licensed dispensers in major discount chain stores (Costco, Walmart, etc.) to move their product exactly like the DCL model 3 mentioned in previous posts. Some of my research has indicated that optometry-based buying groups with over 1000 optometrists cannot buy DCLs at the same low rate as Walmart. As a rule of thumb, optometrists purchase DCLs wholesale, at about the same price Walmart (and other large discount chain stores) retails them to customers. Comment: The “push back” strategy appears popular at present, though perhaps ill-advised. I know of no numbers to tell us what percentage of dispensing practices are including PSAPs in their stock of goods. That will change when/if traditional hearing aid manufacturers add PSAPs to their line up. The pricing issue has been discussed for several years now, first with the VA, then reaching a crescendo when Costco commenced selling Big 6 products to its members at prices not far off of wholesale costs faced by Audiologists. Whether Costco’s sales volume afford it better pricing from manufacturers is not known, but both Northey and classical economic theory suggest it must be so. If there is a mechanism for replacing your patient’s hearing aids/PSAPs via Internet shipping, why does the supplier need the audiologist after the initial test and sale? Of course, the next question is, “How long is an audiogram (legally) valid? 6 months, a year?” Will patients consider patronizing your practice based only on convenience, location, or price? Will patients whose needs are filled by the manufacturer require you at all? Why does the supplier need the audiologist at all? Editor’s note: This is the final post in a 4-part series. Click the links for Part 3 or to begin at Part 1. 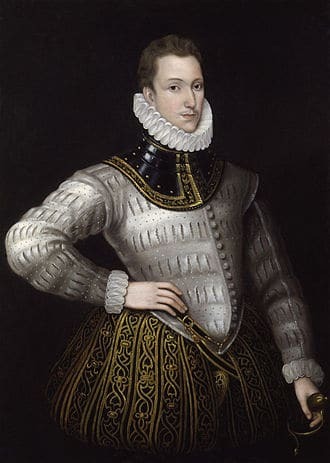 1Apologies to Sir Philip Sidney (above, featured image), Elizabethan poet and soldier, for mangling and possibly plagiarizing his quote to concoct a catchy post title. The unmolested quote can be found in his Defense of Poesy. 2This is not a typo. Hearing aids of yore were Class II Medical Devices in FDA nomenclature. At some point they became Class I devices. 4It is strange. The regulations do require that audiometric air-bone gaps of >15 dB demand medical evaluation, sort of implying that an audiogram happened somewhere along the line. If I’ve read the regs wrong all these years, I beg better-informed readers to set me straight and fix this strangeness. Tom J. Northey founded the first Audiology IPA in Colorado (ACI Network) and negotiated its sale to Starkey in early 2008. Since then, he has held management positions in Health Information Exchange (HIE) and Accountable Care Organizations (ACOs). Currently, he is Executive Director of the California Rural eHealth Information Network (CAReHIN.org). The last line sums it up best: Why does the supplier need us at all? Unlike Optometrists, Audiologists as a group have never placed enough VALUE on their services and never fought for those rights with the same intensity (with some individual exceptions) that brought OD’s prescriptive rights, etc, 20+yrs ago. Sadly, Northey must have been talking to a wall because I think I’ve heard this identical argument for the last several years, albeit with more passion recently due to the major disruptions in the hearing industry. Colleagues, you can’t blame the manufacturers for this, these developments sit almost soley in the lap of audiologists as a group. We sat back apathetic, or at least ambivalent, to these slow changes over the past two decades until suddenly UHC starts selling direct to consumer and all hell breaks loose as if the writing hadn’t been on the wall for years. But, even then, the dust settled and people got comfortable until the next crisis: Phonak in Costco. Unity pops up and starts making some noise….yet, reading the above comment, “buying groups with over 1000 optometrists cannot buy DCLs at the same low rate as Walmart”, should make any AuD realize that even with a “nonprofit” buying group you cannot compete on price with Wal Mart or Costco. Stop wasting your energy! Focus instead on differentiating yourself as a professional and find alternate revenue streams to supplement your practice. Fight for and fund efforts to gain direct access and physician status. These are the only ways our profession can get ahead without going extinct outside of Academia.